Anderson Process offers a wide variety of industrial and hydraulic hoses and fittings. We also build custom hose assemblies in-house and offer other services including on-site hose testing, repairs, and much more. Click or tap the bar above, then scroll, to view the industry-leading manufacturers we represent for each of our hose technologies. 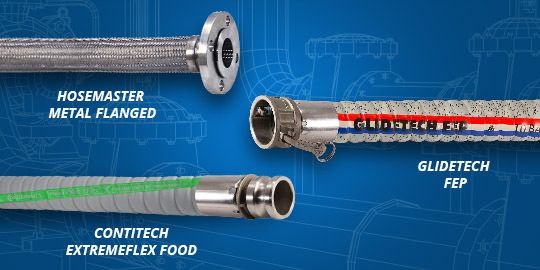 NAHAD-Certified Hose Assemblies Built for Safety And Durability. Proper hose and fitting selection are critical to the safety of both your people and your profits. When a hose fails in an industrial or manufacturing processing operation, the entire production line becomes compromised, potentially putting expensive equipment, product — and even more importantly — lives and the environment at risk. Anderson Process’s comprehensive line of hose assemblies and hose fittings, combined with our maintenance-tracking and reconditioning support services, help our customers realize consistent and safe material containment, movement and transfer. Anderson Process partners with trusted hose manufacturers — including Continental, Eaton and Novaflex — to offer a large selection of industrial hoses for nearly any industrial process application. Our hose assemblies are engineered to provide reliable performance while integrating with the other equipment in the processing line to deliver maximum production output. Our comprehensive line of NAHAD-certified industrial hoses — including metal hose, Teflon hose, composite hose, chemical transfer hose and hydraulic hose — are designed to tolerate even the harshest fluids such as abrasive chemicals and sediment-laden slurries. Specified to withstand the extreme temperatures and pressures commonly needed in industrial processing applications, our hoses are engineered with durability in mind. Our sanitary hoses, which are designed to optimize cleanability, reduce the risk of product contamination in food and beverage applications. We also offer a wide variety of hose fittings, hose couplings, adapters, expansion joints and other hose accessories. Anderson Process’s equipment experts are trained to assess the needs of any application to specify and build custom hose assemblies. Our hose specialists will evaluate the needs of your processing line and recommend a hose specification that will safely optimize processing efficiency while minimizing production downtime. All of Anderson Process’s hose assemblies are candidates for our preventative hose monitoring and maintenance program, which utilizes RFID technology, to help operators achieve real-time visibility over hose maintenance schedules in a controlled, streamlined manner.